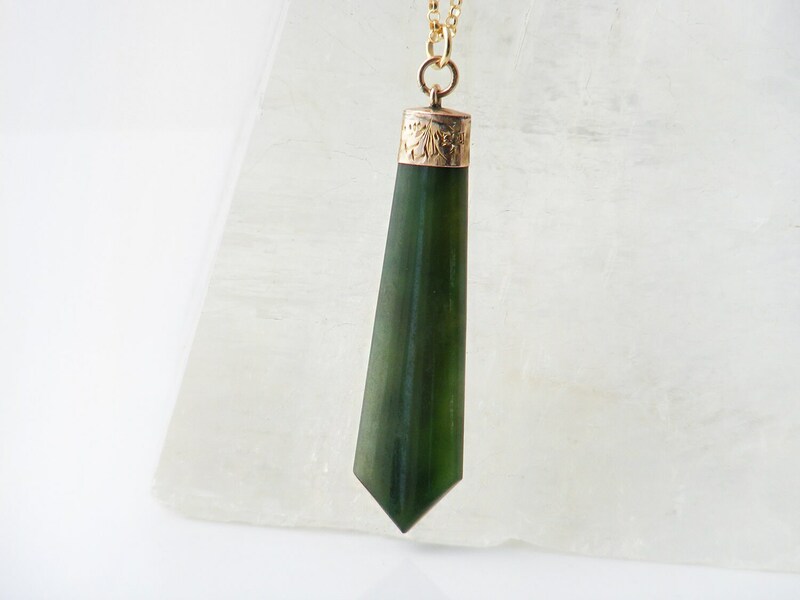 An Edwardian nephrite jade pendant capped with 9 carat gold - originally a watch chain fob ornament, gorgeous on a necklace chain. This exquisite piece has the simple ornamentation typical of the Edwardian era, the emphasis is on the contrast between the beautifully shaped stone and purpose made gold cap. 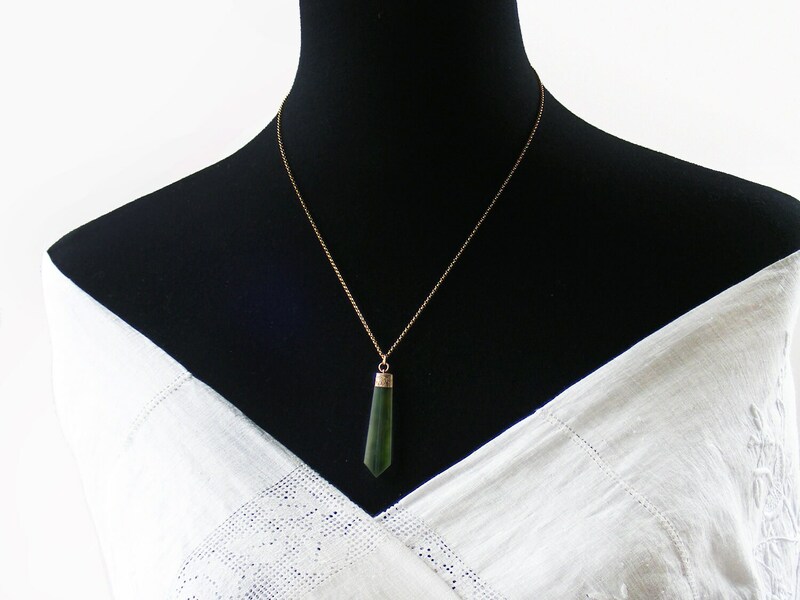 The Stone: deep green Nephrite jade gemstone. 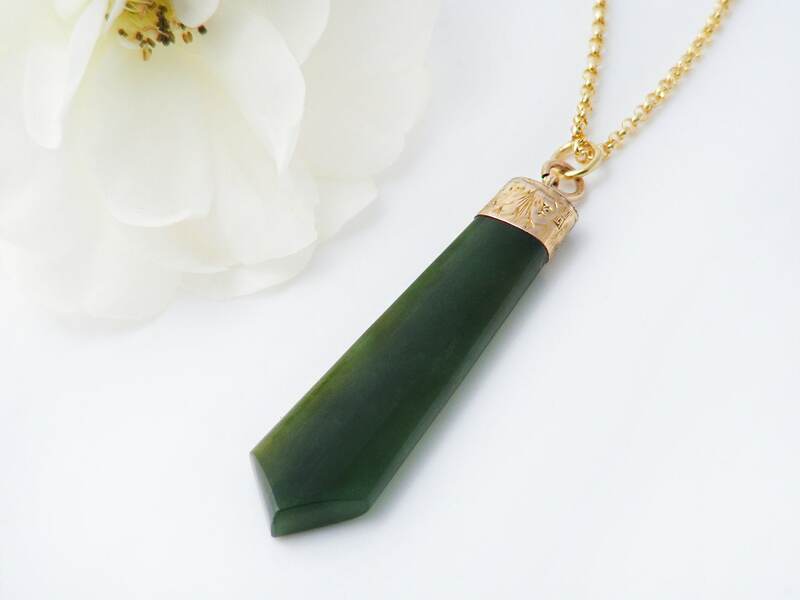 A long, slim, blade shaped stone with superb forest green color and nice cloudy inclusions in light. The Cap: English gold with full hallmarks for 9 carat gold from the Assay Office of Birmingham, England and the year 1906. The attached suspension ring is also stamped for 9ct gold. Length - 1.78 inches or 45mm long, the drop from the chain including the suspension rings is 55mm. Width - 7mm at the top tapering out to 11mm or .45 inches. Thickness - 2.5 - 3mm, tapering off on the bladed edges of the stone. The chamfered tip is 3mm in thickness. 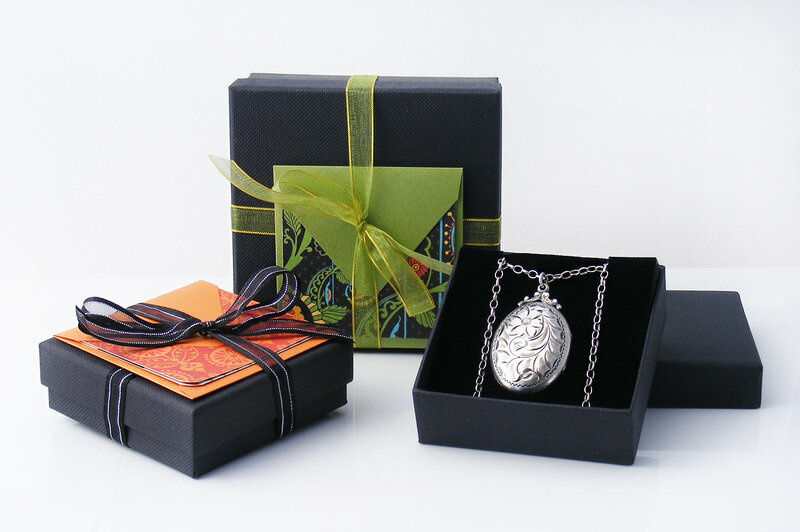 The pendant is presented on a new 20 inch or 51cm Rolo or Belcher chain, 14ct gold fill and stamped as such on the clasp. Photograph #2 shows the pendant and chain on a life size torso. Condition: Excellent. 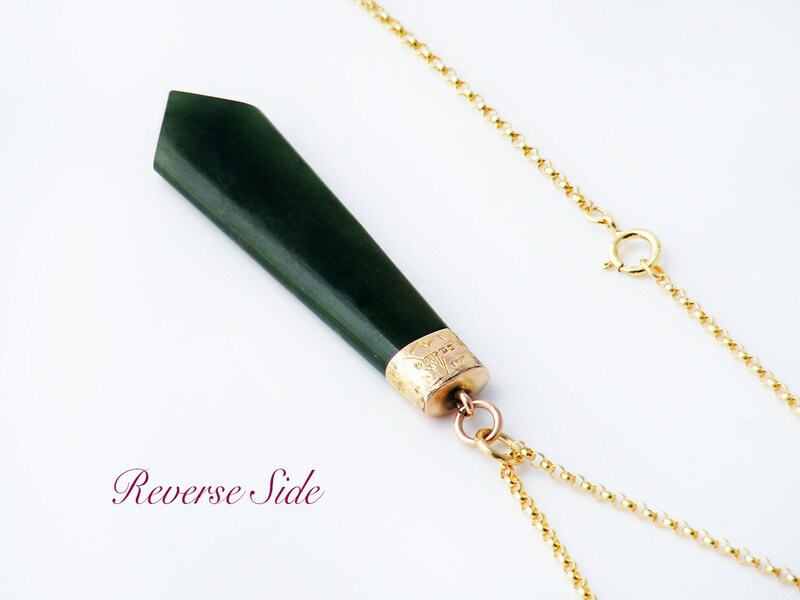 No chips or cracks to the jade, the tip is complete and the cap is secure and lovely. The stone is worn smooth and is very nice to handle. 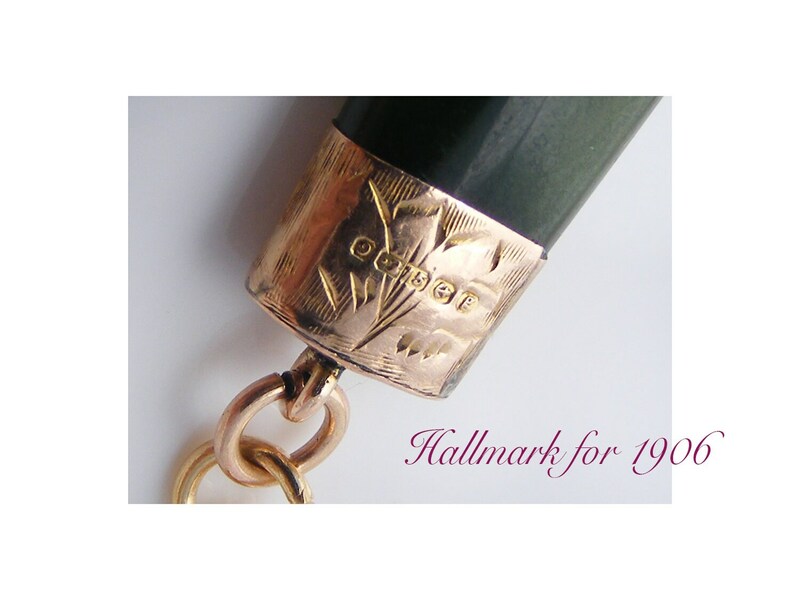 A refined and lovely piece of jewelry, typical of the Edwardian era - a true beauty. it is VERY unusual to find a full hallmark on these pendants.